Mississippi wildlife officials believe the spike in poaching is directly tied to more alligator hunting shows on TV. One official says they see the shows and just think it's cool. JACKSON, Miss. (AP) — When Kathy Wilkinson of Eco-Tours of South Mississippi took a boat filled with guests on a recent tour this week, she saw something she said is becoming all too common, an alligator killed by poachers. Upside down with its mouth taped closed, it wasn't exactly the wildlife encounter her clients wanted to see, either. Wilkinson said she has found other dead alligators in her years on the lower Pascagoula River, but the numbers have jumped. Last year, two of the alligators she found dead were missing their tails, indicating to Wilkinson they were killed illegally for their meat. When her guests see alligators that have fallen victim to poachers, Wilkinson said the situation becomes even more frustrating. “We try to put Mississippi in an excellent light, so it's disheartening,'' Wilkinson said. It's so disheartening, Eco-Tours of South Mississippi is offering a one-time, $500 reward to anyone who provides authorities with information leading to the conviction of someone illegally killing alligators on the Pascagoula River south of Cumbest Bluff, located in Jackson County. “It's small, but maybe it will get people to talk,'' Wilkinson said. Lynn McCoy of McCoy's River & Marsh Tours said he's making the same $500 offer on the Pascagoula River from Cumbest Bluff to the northern headwaters. 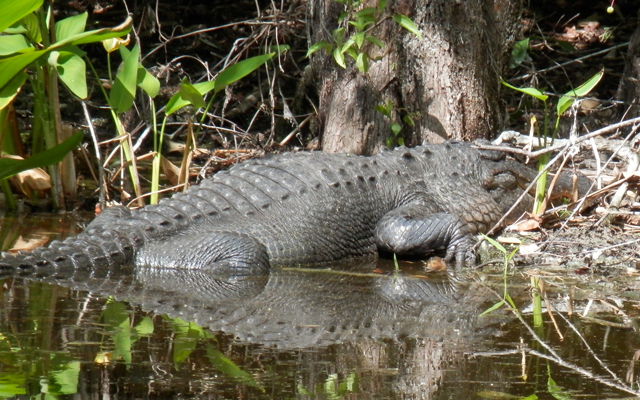 “We don't see a quarter of the alligators we were seeing,'' McCoy said. “It's done got completely out of hand. What concerns McCoy even more is that he feels the most important alligators are also the most vulnerable. “Some of the large females that are taken are right in front of the nests,'' McCoy said. “They are reluctant to leave. Steve Adcock, Mississippi Department of Wildlife, Fisheries and Parks law enforcement chief, confirmed that alligator poaching has been on the rise. And now, the department is focusing on the Pascagoula River. Among those convicted in the past, Adcock said some seemingly illegally killed alligators for the novelty of it, while some did it for their meat. But there could be another driver. Regardless of motivation for poaching, alligator hunter Ken Martin of Brandon wants it stopped. “I personally think they're pretty despicable,'' Martin said. “They're just doing it to satisfy their own adrenaline lust and that puts the rest of us in a bad light.